Benadryl is a medication that is sometimes recommended to be given to cats. It is usually very safe to give, but it's important to know what exactly Benadryl is, exactly how much to give your cat, and when to know if your cat needs Benadryl. Benadryl is the brand name for a drug called diphenhydramine hydrochloride. Benadryl is an over-the-counter antihistamine medication, so it does not require a prescription. This antihistamine can be purchased as tablets, capsules, liquid gels and even liquid in multiple strengths or milligrams depending on your needs. Benadryl is sometimes combined with other medications that can be dangerous to a cat. Because of this, you will need to be sure to read the package carefully when purchasing the drug to ensure that diphenhydramine, the active ingredient in Benadryl, is the only drug in the product you are purchasing for your cat. Generic diphenhydramine is also available, as well as a faster acting injectable form that your veterinarian will have available. Since it is an antihistamine, Benadryl blocks histamine and acetylcholine from being released into the body. These chemicals are released in the body in response to an allergic reaction not only in cats, but also people, dogs, and other animals. Benadryl addresses the symptoms of an allergic response or allergies by drying up watery eyes and runny noses, and decreases swelling, sneezing, itching, and more. When a cat is stung or bit by an insect, such as a bee or scorpion. When a cat is bit by a venomous reptile, such as a snake. When a cat is itching or scratching from environmental or food allergies. Flea allergy dermatitis is a common problem in cats and Benadryl is often recommended. When a cat is travelling and may experience motion sickness. This will help prevent your cat from vomiting. When a cat is in need of something to make it a little sleepy, such as during travel, so that it doesn't get impatient, bored, or cry when it instead needs to be calm and quiet. When pre-treatment of an antihistamine is needed prior to a vaccination that is known to cause an allergic reaction in that cat. Vaccine reactions are not common but if they do occur or have occurred in your cat in the past, Benadryl will be given. You should have some Benadryl on hand in your pet first aid kit if you have a cat, even if you never plan on travelling with it or it doesn't have any known allergies. It is difficult, if not impossible, to predict when an insect will sting your cat and cause an allergic reaction. If you have Benadryl available, you may be able to lessen the allergic response that your cat would experience by giving your cat a dose. Some allergic responses can be deadly, though. Some cats react so severely to insects or venomous reptiles that they cannot breathe without antihistamines, such as Benadryl, and immediate veterinary attention is necessary. This is especially true for brachycephalic or "smush face" breeds, like Persians, that already naturally have compromised airways without the added airway constriction that an allergic reaction can cause. If you have a highly stressed or anxious cat and want to make it sleepy. Its anxiety and stress need to be addressed and treated instead of just sedating it with Benadryl. If your cat has heart disease, consult your veterinarian before giving Benadryl. If your cat has high blood pressure, consult your veterinarian before giving Benadryl. If your cat has glaucoma, consult your veterinarian before giving Benadryl. 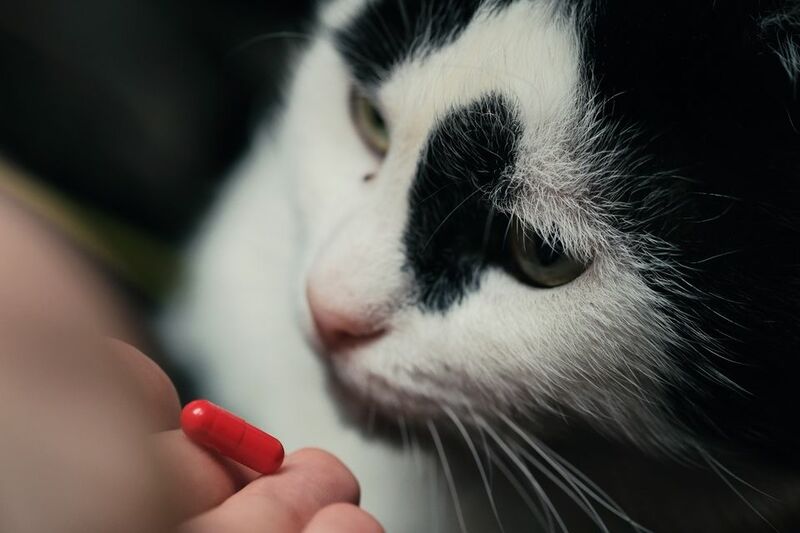 If your cat is taking specific medications, you should discuss the safety of using Benadryl in your cat with your veterinarian prior to administering it. Benadryl is not the sole remedy for a venomous bite from a reptile or insect. Your cat needs immediate veterinary attention. Typically, cats take 1 mg of Benadryl for each pound of body weight two to three times a day. This means a 12.5 pound cat will take half of a 25 mg Benadryl tablet up to three times a day, depending on your veterinarian's recommendation. Cats under 12.5 pounds may be more easily dosed using children's Benadryl liquid since it can be dosed more accurately. Benadryl can cause sleepiness, dry mouth, or urinary retention and potentially cause some gastrointestinal upset, such as diarrhea and/or vomiting. In cats, it may also cause the opposite of what it is used for. This is called a paradoxical effect and a very excited or jittery cat is usually the result of this effect. Benadryl is usually extremely safe, but if too much is given to your cat, it can cause lethargy or excitement. Occasionally, a cat may also develop dry mouth, have respiratory depression, seizures, go into a coma, or even die if a large enough amount is administered. Before giving your cat any type of drug or supplement, you should always discuss it with your veterinarian.